Peppermint delights my pallet during the Christmas season. There’s something so crisp and bright about the flavors. 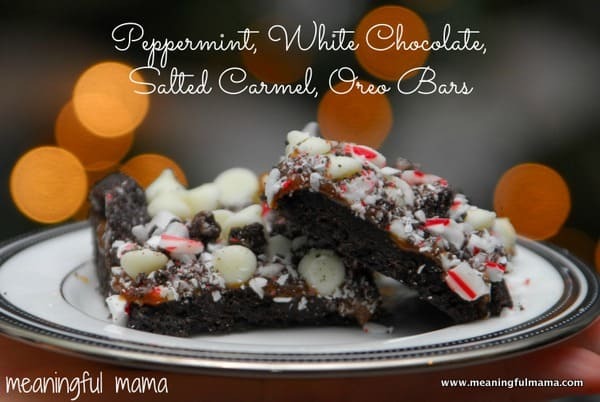 As I was considering making a new kind of bar cookie, I decided that I wanted to try something with peppermint. 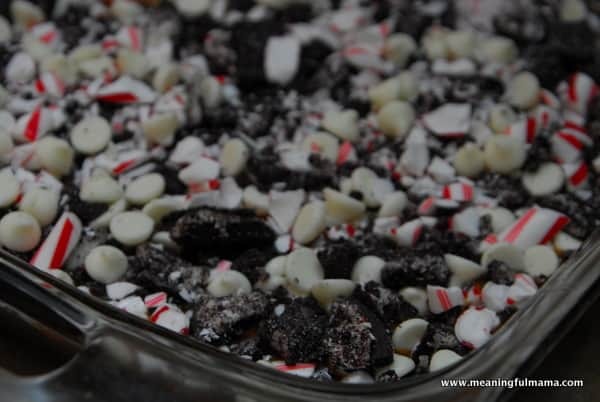 I figured I couldn’t go wrong to add the peppermint flavor profile to white chocolate, salted carmel and Oreos. Yummy. Preheat oven to 350. Combine Oreo crumbs and melted butter completely. 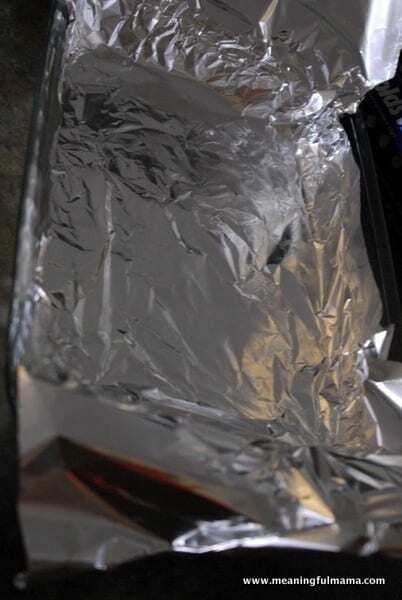 Line a 9×13 baking dish with foil. 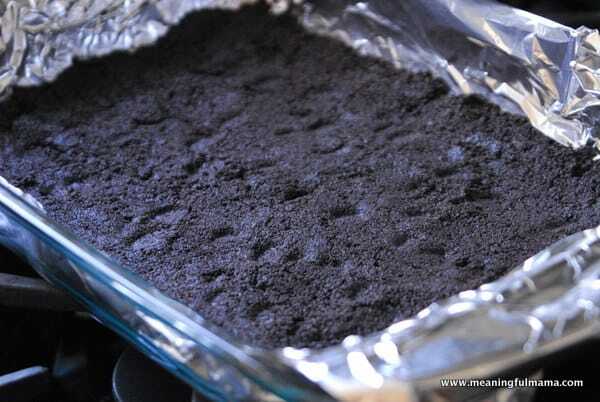 Press the Oreo crumb mixture into the dish. Bake for 12-15 minutes. Cool completely. Let the carmel cool to the touch but don’t let it solidify too much. It should be thick but easy to poor and spread. Spread the salted carmel over the top of the cooled Oreo crust. 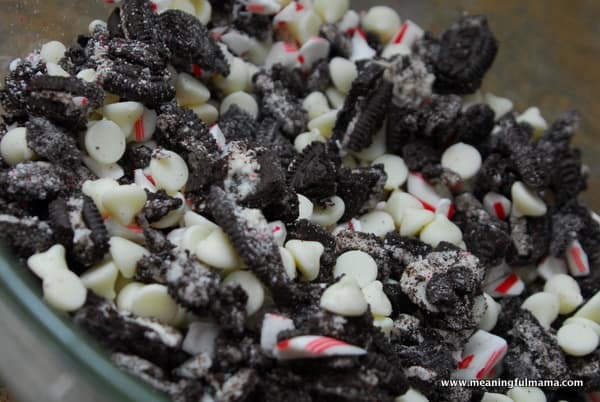 Coarsely chop Oreos and Candy Canes. I did these in separate bags and use a meat mallet to pound them out. Mix all three ingredients together. Sprinkle this mixture on top of the salted carmel. 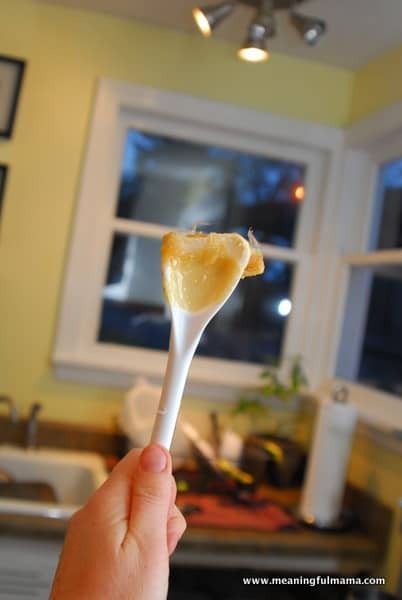 Let set in refrigerator or on counter until carmel thickens. Remove from pan by pulling up on the edges of the foil. Cut into bars. Lining your 9×13 pan with foil ensures easy removal. Press the Oreo cookie butter mixture into your pan. You will want to bake it for 12-15 minutes and let it cool completely before adding the carmel. You might want to make sure you spoon is heat resistant. I couldn’t believe what happened to mine. I was sitting and stirring with it the entire time. It took me a while to realize what was happening. Yes, I started over and made a new batch of carmel. I’m pretty sure I ruined the pan though. 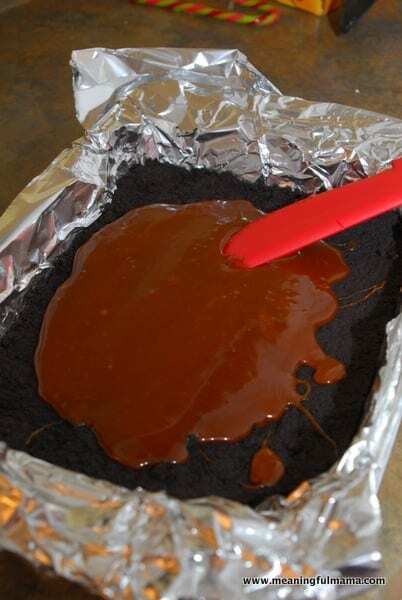 Spread your carmel over the top of your Oreo crust. 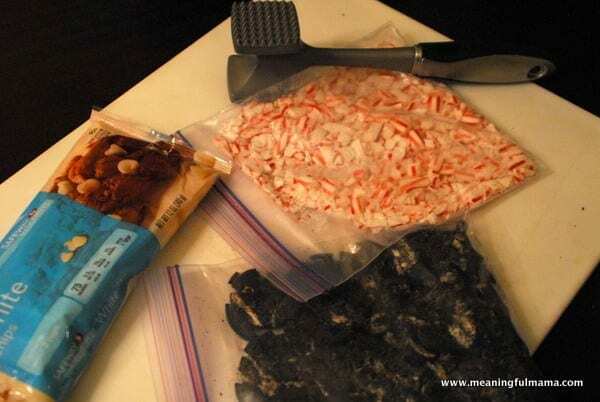 I used separate bags for the candy canes and Oreos as I hammered them out. 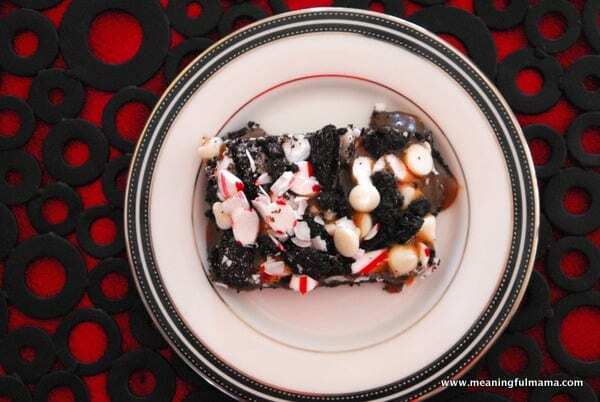 Mix up the Oreos, peppermint and white chocolate chips before adding them to the top of the carmel. Sprinkle the mixture on top, let it set and then delight your guests. Serving size depends on how big you want to cut your pieces. I always love to hear what you think! Let me know how the flavor profile worked for you. My family would eat these up in a heart beat. YUM! Pinned them, and can’t wait to try them out. Thanks so much for letting me know. I hope you really enjoy them!